The images beamed back to Earth by NASA’s New Horizons mission and its fly-by of Pluto have given us a tantalising first look at the surface of a member of a well populated class of objects : dwarf planets that inhabit the outer reaches of the Solar System beyond Neptune, within the Kuiper Belt and possibly the enclosing Oort Cloud. Technological constraints limit the rate at which new images can be transmitted to Earth, so right now we only have a minimal number of images compared with recent missions to other Solar System bodies. Even though some of these images, though not all, are of excellent quality, NASA and its associated scientists are currently very reticent to spell out what they think these preliminary observations might mean in terms of the geological evolution of Pluto and its principal moon Charon. Here’s what the Pluton-Charon system looks like in true colour. I believe that the sizes are to scale, but I’m not sure about the distances. This image gives you a good idea of the size of Pluto and Charon compared with the Earth. Note that the sizes are scaled, but not the distances. For those who prefer, here’s Pluto and Charon compared size-wise with our Moon. The point here is to emphasise just how small Pluto is. Previous knowledge of Pluto’s size and mass and therefore density, has been refined by data from the fly-by, confirming this model of the internal structure of the dwarf planet. It’s still theoretical, but there’s probably a large rocky core surrounded by a mantle of water ice or slush (maybe an ocean ? ), and an outer crust of ices of various compositions. What about the dwarf planet’s surface ? What’s it made of ? 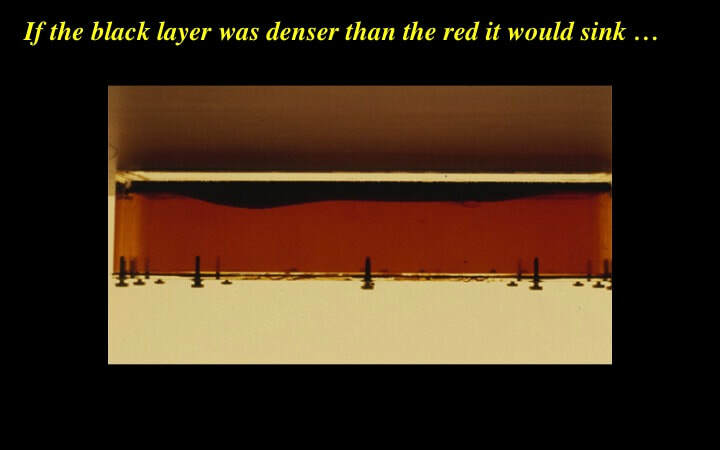 It turns out to be coated in various ices including methane, nitrogen, carbon monoxide and water. Interestingly, the New Horizons probe measured significant spatial variations in the concentrations of methane and carbon monoxide ices, but did not measure water ice. Instead, the presence of water ice is a deduction from visual observations, as I’ll show you later. As the first well-resolved images were received from the approaching probe, planetary scientists got a few surprises : the surfaces of Pluto and Charon are quite different from one another, and not just in size (note the scale bars). Pluto has many intriguing features, including bright and dark areas, and mountains (positive relief) - while Charon is darker overall, with a dark polar ice cap and chasms (negative relief). Here I’m going to focus on Pluto. 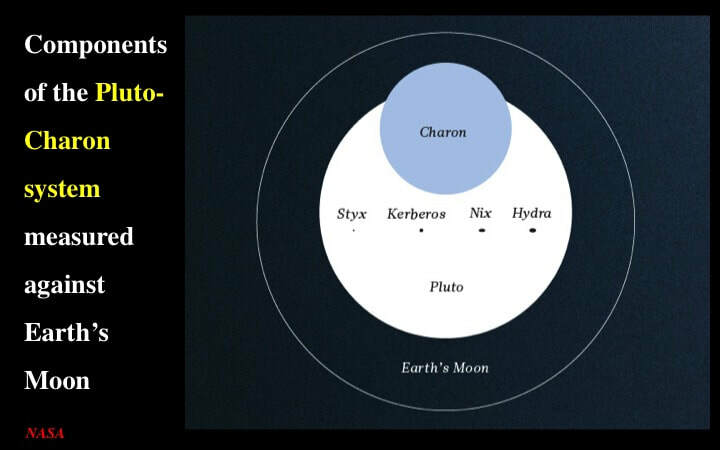 Three principal components of Pluto are illustrated in this slide : First, there’s a broad band of dark material – most likely hydrocarbons ("tar") – confined to the equator. For the moment, no-one’s speculating on what it’s doing there, but I will in just a moment. Second, there’s an oblique band, about 1000 km long of "complex patterns". I’m really not sure what to make of this for now, but it clearly contains some circular bull’s eye features that resemble impact craters. Why would they form in a band ? Maybe they didn’t. Maybe the band is a function of the preservation of features that once covered the entire surface, but have been buried or otherwise erased elsewhere. More on this in a minute. Third, there’s the enigmatic "polygonal feature". In fact it’s a symmetrical hexagon. I’ve recently discussed my views on hexagonal crater outlines as a simple function of the collapse mechanics of the transient cavity that forms as part of the standard model of impact cratering. It seems that NASA still can’t face up to the fact that hexagonal impact features occur throughout the Solar System. For example some 20% of all lunar impact craters are symmetrical hexagons, as opposed to circular in plan-view. New Horizons did not image the entire surface of Pluto, but this view is quite distinct from the previous image and illustrates a number of new observations : First, note how the dark equatorial belt is here broken up into a set of large spots (~500 km across). This is a key feature that I’ll return to shortly. In this image, NASA notes the presence of possible impact craters, although the impact crater density is anomalously low indicating that the dwarf planet’s surface is relatively young. In other words, relatively recent geological activity has erased its early history. Given Pluto’s small size and context, this was an unexpected surprise ! More on this in a moment. Thirdly, note the arrow pointing to the bright "heart" on the northern horizon. 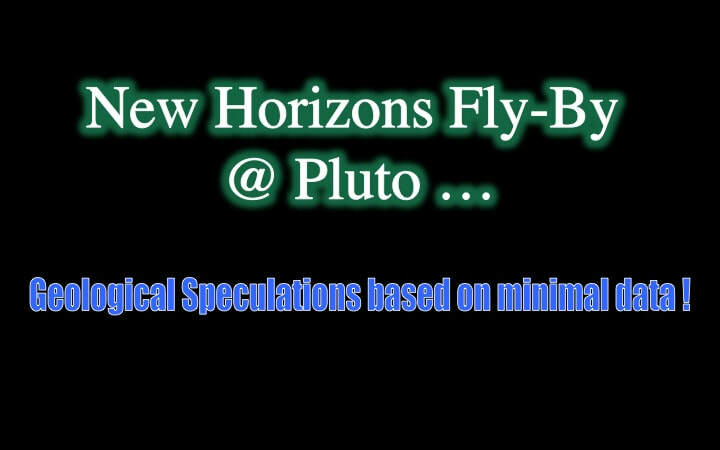 ​... and this is the #1 thematic problem for Solar System formation that the New Horizons fly-by has highlighted. What is generating that internal heat in a dwarf planet that - until just a few weeks ago - was supposed to be old, cold and dead ? An analogy with the Jovian moon Europa immediately springs to mind. However, if you examine the models for the internal structure of Jupiter’s principal moons, you can readily see that Io, Europa and Ganymede are differentiated bodies with a dense core, an intermediate mantle and a light crust. The interior of Callisto, on the other hand, is made of homogeneous rocky material, presumably still representing accreted chondritic meteors and asteroids. This is a critical observation : Io, Europa and Ganymede are relatively close-in with respect to the enormously powerful gravitational pull of Jupiter. It is this gravitational influence that periodically squeezes the moons and heats them up internally – thereby allowing them to melt and differentiate. Callisto, being further out, is less squeezed and therefore internally colder, hence it has not melted and differentiated. Pluto, may or may not be differentiated in its rocky component, but it still requires internal heat for its surface to be geologically active. However, it’s not orbiting a nearby giant planet, which raises a thorny issue for planetologists : what is the source of internal heat that allowed the dwarf planet remain geologically active until the present day ? Before you ask - gravitational tidal interaction between Pluto and Charon is insufficient to account for the required internal heat. Right now, nobody is guessing how to explain this internal heat : not even me ! Despite this major unresolved issue, let’s now take a closer look at the geological activity itself on Pluto’s surface. Some of you may remember a presentation I gave a decade ago on the Moon and the origin/distribution of it’s basalt lavas. 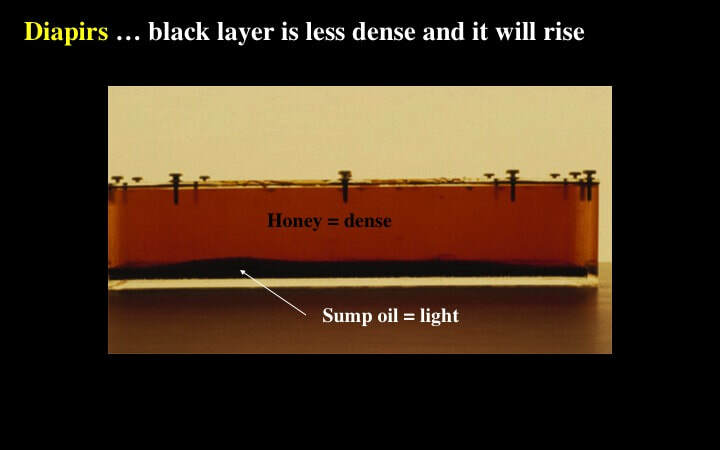 I showed you an experiment I’d done many years before where light sump oil (black) was allowed to rise through an overlying layer of denser honey. The reason it rises is that it’s what light stuff does when overlain by denser stuff - in a gravitational field. 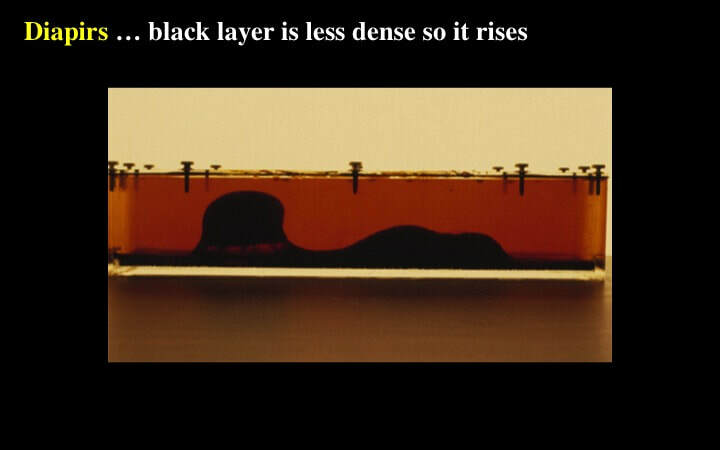 Now, imagine for the sake of argument that the black layer was the denser material and that it overlies less dense material. All I’ve done here is to turn my slides upside down, but imagine that this illustrates cold (denser) ice overlying warmer (less dense) ice. The same pattern is established in the presence of a gravitational field, but the phenomenon we’re imagining here is one of periodically spaced sinking rather than rising. In the real world, as opposed to a lab experiment, the free surface of Pluto would sink too - right above the downwelling denser ice - forming basins with a regular spacing. Why would the "spots" be regularly spaced along the equator ? Possibly there’s a long (1000s km) fault system that provided a structural weakness that allowed vertical motions to focus there. With this speculation in mind, take another look at those "spots". They’re not just featureless "splotches" : they have a definite structure, resembling "lakes" connected by "channels". Where have we seen patches of hydrocarbon like this elsewhere in the outer Solar System ? While you’re thinking about that one, let’s take a look at Enigma #3. Pluto has highly localised mountainous regions located adjacent to the heart-shaped area of Tombaugh Regio. So, let’s now take a look at both the "mountains" and the cryovolcanic "heart". Here’s an overview of the distribution of the mountainous Norgay Montes area and the smooth (crater-less, therefore very young) Tombaugh Regio, with its northern domain known as Sputnik Planum. Be aware that this is only a very small percentage of the dwarf planet’s surface and it may not be representative. Watch the Youtube fly-over, then come back to the rest of these slides. The Norgay Montes mountains (up to ~3.5 km high), unlike the Rockies with which they have been incorrectly compared - soley on the basis of height, by the way – form a chaotic field of bumps as opposed to long, continuous mountain ridges. Note that the linear troughs to the lower-right are lower in elevation than the mountains. They seem to represent negative as opposed to positive relief, and could have formed by stretching of the dwarf planet’s surface. This suggests that – unlike the Rockies – the mountains may not have formed by an horizontal "push". Note that, on account of their height, if the mountains are made of ice, it must be water ice because the other ices are too weak – even at Pluto’s temperatures – to support the weight of such peaks. This, by the way, is the primary evidence for the presence of water on Pluto ! So, if Norgay Montes didn’t form by horizontal compression, how might they have formed ? Let’s speculate ! Where do we see similar terrain to Norgay Montes elsewhere in the Solar System ? How about the Earth’s Arctic ? Ice across the Arctic can rise up as localised hills (Pingos), but only to a height of ~50m. Simple calculations could be done to test this as a possible mechanism for the chaotic and highly localised "mountains" of Pluto. Maybe this has already been undertaken and found wanting. So, what are our other speculative options? Well, when I hear "chaotic and highly localised" I immediately think of "weird terrain" : a localised area of jumbled blocks, each 5-10 km across and up to 2 km high, that occurs on the surface of Mercury, diametrically opposite to the giant, multi-ring Caloris Impact Basin. It formed as a function of the refraction and focusing of seismic waves generated by a massive impact on the opposite side of Mercury. The result was that huge blocks were literally tossed up and fell back as a jumbled, "weird" mess ! Is that what Norgay Montes represents ? So, what about heart-shaped Tombaugh Regio, and in particular the patterned northern part known as Sputnik Planum ? This is a smooth area, free of impact craters, hence it is thought to be relatively young (<100 My). It likely represents a resurfacing of the dwarf planet surface by nitrogen ice erupted from the interior, analogous to lava flows on Venus (hence the term cryovolcanism). 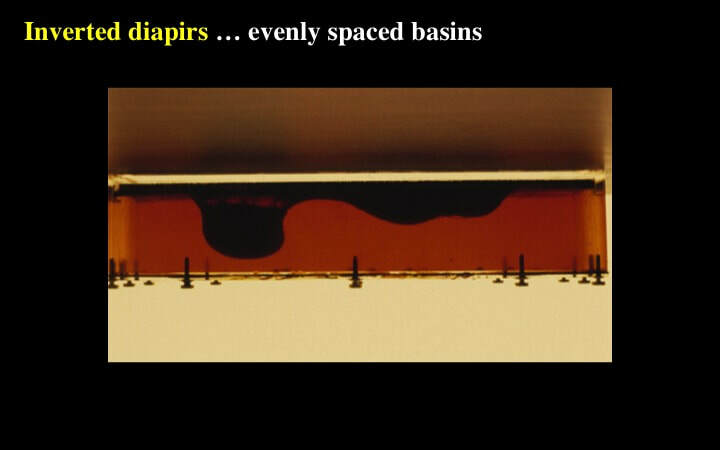 However, NASA-associated scientists seem to prefer an analogy with glaciers on Earth and Mars. The flow of the nitrogen ice around topographic obstacles would fit with either interpretation, but the cryovolcanic model provides us with a ready source of the ice : the glacier model doesn’t. However, there’s more to see here : note the commonly elongate polygonal patterns, some 30+ km across. The polygons are delimited by narrow troughs, some of which are occupied by black material (hydrocarbons ?). Notice how the polygon boundaries have evolved by the formation of initial chains of pits (~1 km) that coalesce to form the troughs. We’ve seen something like this before, on Mars where fractures guide the emplacement of magmatic dykes that freeze below the surface, creating sub-surface voids into which material collapses to form pit-chains that grow into elongate holes. This might suggest that the polygons on Pluto are defined by faults associated with subsurface voids, of whatever origin. ​Remember, we’re dealing with ice here, and ice can sublimate into a vapour that can escape from tiny Pluto. Whatever, this possibility has to be incorporated into any explanation of the polygons of Pluto. Right now, however, NASA-associated scientists are not thinking straight: some have suggested that the polygons might be contraction features akin to mudcracks. This makes no sense whatsoever. Mud cracks are hand to dinner plate scale. Polygons in the Arctic tundra are up to 100s of metres across, but on Pluto the polygons are 10-100 km in scale. The only appropriately scaled Solar System analogue that comes to mind is the polygonal terrain on Mars - and that terrain still defies explanation ! Finally, here’s the only decent image available for Pluto’s moon Charon : but it says it all ! This tiny body should be dead as a door nail, but though it does indeed sport impact craters, they are few and far between. As for Pluto, its surface appears to have been geologically active in the recent past. Most interesting are the canyons with their troughs and cliffs, ~1000 km long and up to ~10 km deep. How did they form ? The options are numerous : collisions, global expansion, or tidal stresses generated by the Pluto-Charon system ? It’s going to be interesting to see what the theorists come up with in their computer models ! That’s all I have for you for now, but we can expect to receive more data over the next year and a half. Most importantly, whatever you may think of what I’ve suggested to you here, remember that it is all pure speculation based upon minimal data – and it may all be wrong !